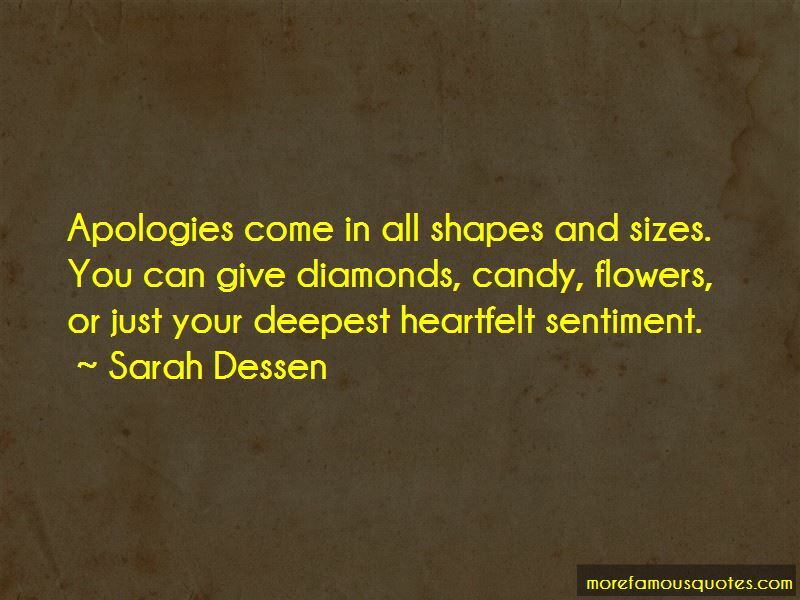 Enjoy the top 1034 famous quotes, sayings and quotations by Sarah Dessen. So you're always honest," I said. "Well, that's good to know, I guess." "I'm not saying I'm a liar," I told him. He raised his eyebrows. "That's not how I meant it, anyways." "How'd you mean it, then?" "I just ... I don't always say what I feel." "Because the truth sometimes hurts," I said. "Yeah," he said. "So do lies, though. It was like when you're a little kid and you run into your teacher or librarian at the grocery store or Wal-mart and it's just so startling, because it never occurred to you they existed outside of school. And for one second, it was like I could feel the timing clicking together, finally pieces falling into place. If you could just be nice, then you wouldn't have to worry about arguments at all. but being nice wasn't as easy as it seemed, especially when the rest of the world could be so mean. “But you, fine sir." John Miller clapped Dexter on the shoulder, a bit unsteadily. "You have problems of your own." "This is true," Dexter replied, nodding. "The women," John Miller sighed. Dexter wiped a hand over his face, and glanced down the road. "The women. Indeed, dear squire, they perplex me as well." "Ah, the fair Remy," John Miller said grandly, and I felt a flush run up my face. Lissa, in the front seat, put a hand to her mouth. "The fair Remy," Dexter repeated, "did not see me as a worthwhile risk." "I am, of course, a rogue. A rapscallion. A musician. I would bring her nothing but poverty, shame, and bruised shins from my flailing limbs. She is the better for our parting." John Miller pantomined stabbing himself in the heart. "Cold words, my squire." “You know," I told him,"if you don't know how to eat a cupcake, that's nothing to be ashamed of." Now he did smile. "I know how to eat a cupcake." "I do," he said. "I just don't want one of those." “As I shut the door and started to walk away, I heard him say, "Hey. Sydney." It's hard to be nice when the rest of the world is so mean. He'd always had that fearless optimism that made cynics like me squirm. I wondered if it was enough for both of us. I would never know from here, though. And time was passing. Crucial minutes and seconds, each one capable of changing everything. And that was as far as he got before i heard it. The thumping of footsteps, running up the lawn toward me: It seemed like I could hear it through the grass, like leaning your ear to a railroad track and feeling the train coming, miles away. As the noise got closer I could hear ragged breaths, and then a voice. But I saw Blake earlier and he said he and Nate were taking off for an overnight business thing. So ... "
" ... you're just going to jump their fence and their pool," I finished for her. Silence. Then Jamie said, "It's twenty-five degrees! In December! Do you know what this means?" Everything looks different when you're older, not staring up at the world but down upon it. From what I could see, the hardwood was just fine. Then again, I'd just see a windmill and an open sky, too, never feeling the need to conquer either. You think it's all obvious and straightforward, this world. But really, it's all in who is doing the looking. Nah," I said. "But if it does, just tell him I said to get back on the bike." I mean, at least with an argument, you know what's happening. Or have some idea. Silence is ... it could be anything. Maybe it was a stupid exercise, and you couldn't grow things in winter. But there was something I liked about he idea of those seeds, buried so deep, having at least a chance to emerge. Even if you couldn't see it beneath the surface, molecules were bonding, energy pushing up slowly, as something worked so hard, all alone, to grow. But idols fall, and sometimes they land right on you and leave you flattened. soccer balls and various pairs of cleats. I'm really happy to have the chance to talk about the editing process. It's something that I think doesn't get the weight it deserves, especially with the rise of self-publishing. Get back on that bike. 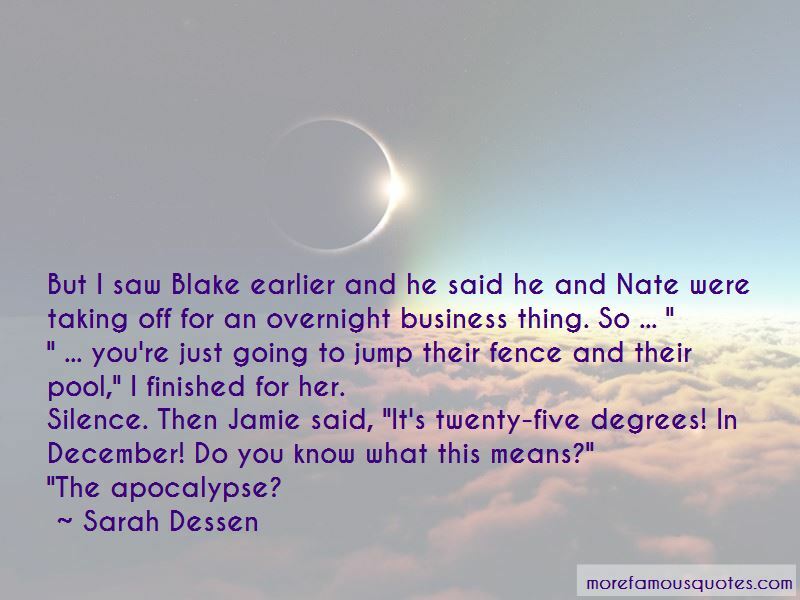 Want to see more pictures of Sarah Dessen quotes? 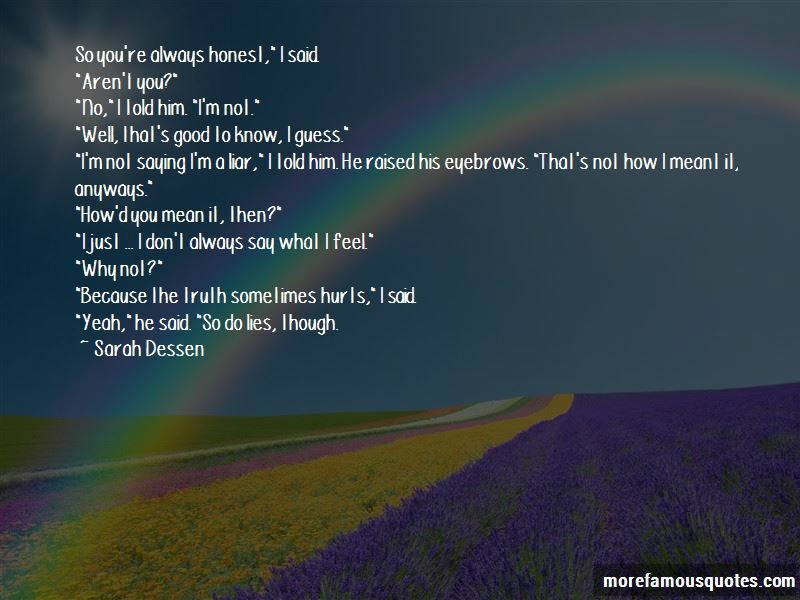 Click on image of Sarah Dessen quotes to view full size.